Vaalu confirmed for August 14th release, reservations from today! There were reporting sating that movie Vaalu had got all the cases withdrawn against it from Magic Ray’s end. Home » Hansika Motwani | Release Date | Simbu | Vaalu » Vaalu confirmed for August 14th release, reservations from today! With All set done, the distributor of Vaalu, ie., STR’s Father T Rajendar of Cimbu Cine Arts had started giving paper ads stating the movie will release on Aug 14. After few days of paper ad again the recent paper ad of yesterday shows that Movie will be releasing soon. Aug 14 release date is removed. But, Here comes the Final word that would make STR fans to repose .. Vaalu all issues gets cleared and ready to eulogize itself on the Big screen. STR Father T Rajendar who has acquired the distribution rights of the protracted delay in Vaalu release has made in official that the film gets out of all struggles that was surrounding it. 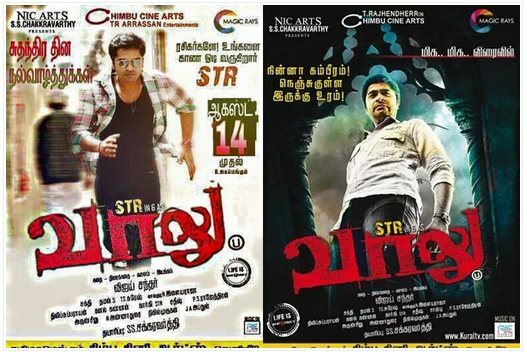 STR further confirmed that newspaper ads with release date will appear from tomorrow onwards. Update: Latest poster confirms August 14th release and ticket reservations starting from today. The Ten seconds Promo of Vaalu movie is also release immediately. STR's Vaalu Releasing Worldwide On 14th August 2015.